article: Why workshops and public speaking? Please contact me if you’d like to schedule a talk or discuss about your event or conference. Here are a few topics I spoke about in the past, but I would be more than happy to craft one in collaboration with you. Brand identity - Brand DNA - how deep will you go? about: speaking to startup owners about branding from a non marketing point of view as a way to approach their own reflection. about: replacing a professor, teaching 2 classes of his this semester. 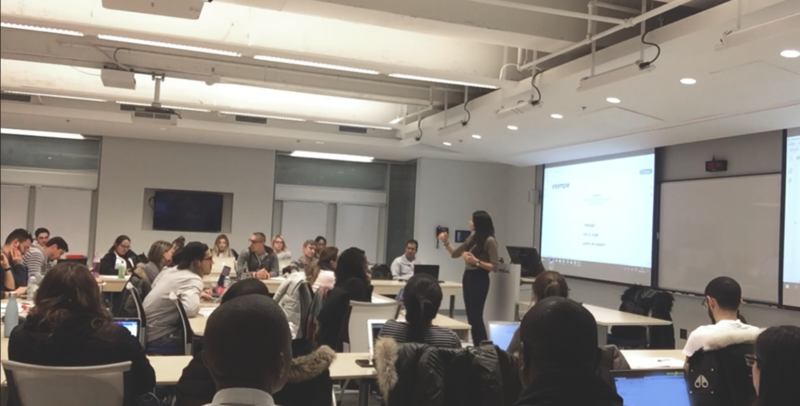 about: invited to speak about the meaning and importance of brands to a class of students completing their DESS at HECMTL. Because the quality of our questions impacts the quality of our decisions and in turn, of our lives. In this picture, the audience is working on the first exercise, consisting of answering a deep question about themselves. Une invitation pour parler de mon parcours et "démontrer que l’on peut suivre son propre chemin, avec succès, sans se trahir (en restant fidèle à soi-même), que nos expériences, nos formations, souvent se combinent pour faire de chacun.e un être unique. Et qu’on ne devrait jamais renoncer à ceci, peu importe notre position (entrepreneur.e, staff, corpo., etc.)." I was invited to speak about brands to a group of engineers completing their master's degree. "Bonjour Vanessa, J'ai eu la plaisir d'assister à votre enrichissante conférence hier à l'ÉTS. Vous m'avez apporté de nombreuses questions essentielles à se poser. J'en viens à la conclusion que l'ensemble de notre vie doit être "mission-driven" ! WORKSHOP : FIND YOUR PURPOSE - YOUR "WHY"
"Thank you very much for sharing your story and insights regarding taking a leap of faith and getting the courage to find our purpose at the event this afternoon! I have recently taken a leap of faith by leaving my corporate job and am currently in a period of transition where I am trying to find my voice and purpose. Your workshop was very inspiring and has giving me hope that I am on the right track and am not alone in this journey. I wish you all the best and hope you continue to inspire people to take leaps of faith!" Many start building their brand or rebranding by working on their external image, such as their logo or website. Yet, strong and successful brands start inside, by travelling deep within to uncover their DNA, to identify their essence, their purpose and their unique value proposition. We invite you to explore what a brand is, how to navigate the process of defining and building your brand from the inside out and to use your brand as a compass to make the best business decisions for your success. Join Vanessa Elle brand consultant, and art director / owner at Vanessa Elle and her invited guest speaker, Pierre Balloffet professor at HEC Montréal who is also behind the growth of numerous startups on Tuesday September 19th from 6-7pm at WeWork Place Ville Marie. I was invited to give a talk on the subject of creativity, brands and sense making. Sharing the 3 convictions that define my entrepreneurial path. Brand consultant and art director Vanessa Elle will teach you about how to build and live your brand from the inside out, while also guiding you to deeply reflect on it, as you learn about the "brand as business" approach. We are honoured to have Vanessa Elle with us for share her story, her travels, and her passion for photography and videography. Come spend an inspiring time with her. I had the pleasure to interview: Pina Marra, Serge Jean Laviolette, Michelle Laberge, Antoinette Di Carlo, and Rita Elias.